I love having the chance to try an iconic local food when I’m travelling, don’t you? Most recently Borsch is that food, and wow did I enjoy it on a trip to the Ukraine. While visiting Kiev I tried it for the first time on the night we arrived, and that left me wanting more. I enjoyed a bowl of borsch nearly every day in Kiev and was pleased to find some when we returned to Brno. Borsch, also spelled boršč or borscht, is the beet soup of Slavic countries. While it is important in Russian and Polish cuisines, Ukraine is often cited as its place of origin. Even if you don’t like beet root prepared in other ways, I think you will like borsch. The broth-based soup has many variations, but most contain beet root giving it a beautiful red color. It is typically made by combining meat and broth with sautéed vegetables, which usually include beets, cabbage, carrots, onions, potatoes and tomatoes. Some of the vegetables are grated or cut into strips before cooking which produces a hearty texture for the soup. In addition to vegetables, borsch often includes beans and meat or fish. I enjoyed a small pork rib served in my first bowl, and some beef in another. It has a distinctive, sweet and tangy taste that results from the beets and vinegar, dill, garlic, tomato paste, and other seasonings added during cooking. 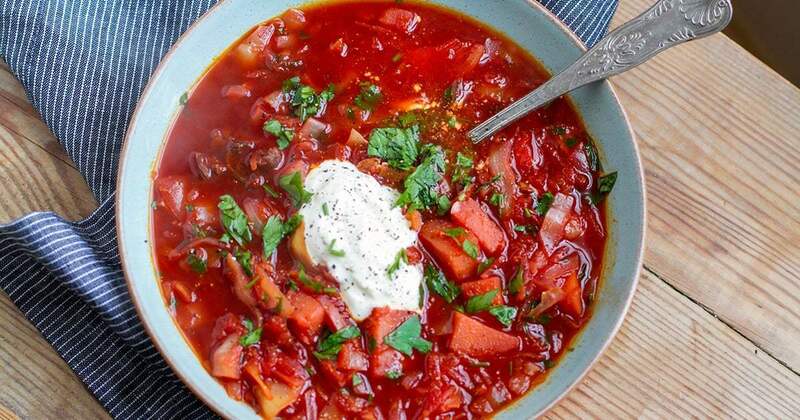 Borsch is served with a dollop of sour cream which is usually mixed in before taking your first spoonful. There are many national and regional varieties of borsch including white and green that can be served hot or cold depending on the season, which makes it interesting to try as you travel in Europe and Russia. In Kiev, the red borsch was served hot with bread, either pampushki, small yeast rolls served with garlic sauce, or a hearty slice of dark brown bread with lard. So, I hope you are ready to enjoy some, and I have good news, you don’t need to leave Brno to find a great bowl of borsch. Local restaurants with borsch on the menu include Samovar and Tryzub. If you prefer to make it yourself, I’ve included a recipe here. Nutritionally, red borsch is a great choice because it contains a variety of vegetables and beans. It is low in calories, and with plenty of beets, cabbage and beans it contains a good amount of fiber, vitamins B & C and potassium. When you enjoy it with some whole grain bread you have a healthy combination. I hope you will beet the crowd and let me know where you find good borsch in and around Brno! Every dish I had there tasted like they forgot to add at least one essential ingredient; I mean apart from moisture or flavour. Unfortunately, it is currently a wasted opportunity. 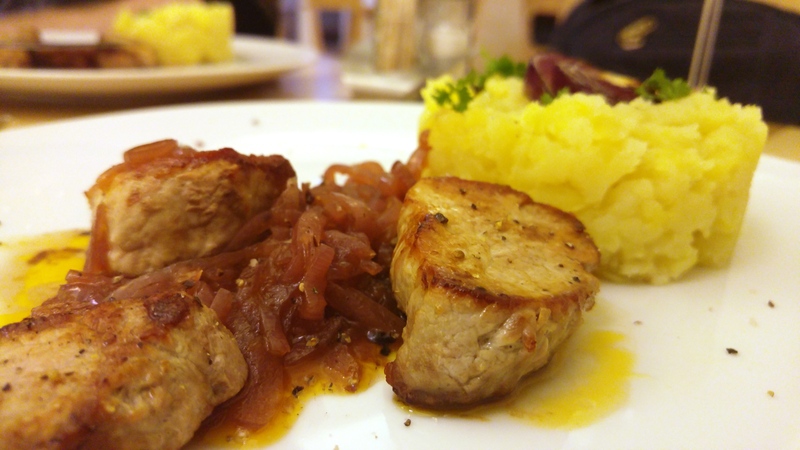 Greeks constitute a sizable community in CZE so it is no surprise that delicious Greek food can be had in Brno. 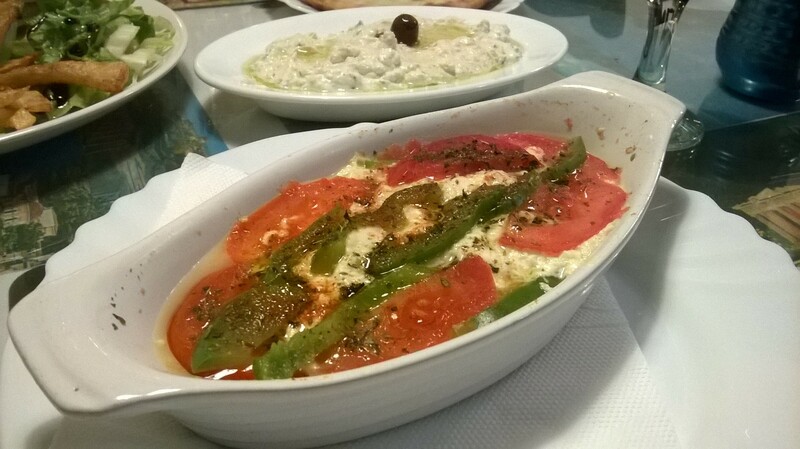 If you didn’t make it to Greece this summer, at Ellas you’ll almost feel like you’re there.